Four friends waiting for green on a Saturday afternoon. lovely. following you over the years (is time flying or what?!) it's always nice to see the season change. That is one of my favorite aspects of global connections, getting to see own perspectives from eyes on the streets like you and lars. Who cares what kinda bike, what type of weather, what you wear, what country. This sums it up. hahaha. nice place for biking.. But be sure to drive safely, fast vehicles are always prsent on that road. I'm considering buying a folding bike to combine train/bike journeys but I'm so turned off at how un-chic and awkward most of them look! The two on the right look pretty fab though. I've found around London the best looking small/folding bikes are vintage Raleighs and Stowaways. I wish they made some like that still. the best way to bike is with friends! they motivate you to keep going! I lived in CPH for 1 1/2 years (I'm American), and am living in Brooklyn at the moment. I bike around here, but it's just not the same without friends who are also on bike. 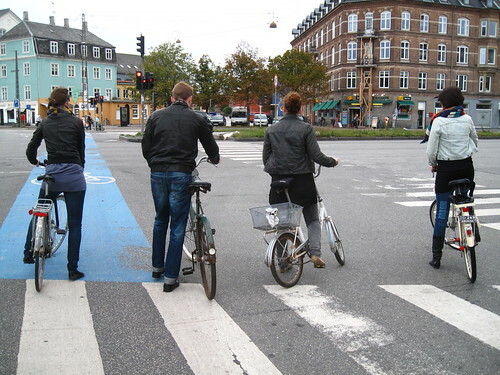 Thanks for your blog- it really reminds me of the beauty of Denmark and cycling. The Danes really do it right... I long to go back there to live again!